Preheat oven to 400°F. Grease an 8 x 4-inch loaf pan and set aside. In the bowl of a stand mixer, combine flours, baking powder, baking soda and salt. Add beer (recommended: Samuel Smith's Organic Lager) to the mix and stir until just combined. Pour batter into greased loaf pan and bake about 30 minutes, or until a toothpick inserted in the center comes out clean. Remove from oven and allow to cool 5 to 10 minutes in the loaf pan before removing from the pan and allowing to cool completely on a cooling rack. If ever you need a reason to drink – whether it’s 5 o’clock or not – this bread is your perfect excuse. I’m not saying this bread will drive you to drink. Quite the opposite, actually. It’s one of the easiest quick breads you’ll ever make that doesn’t even taste like a quick bread. 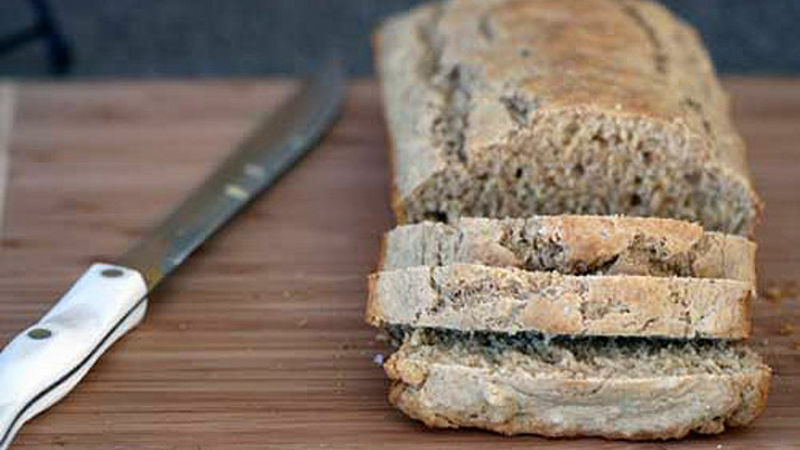 When I made this Organic Beer Bread one morning, I was pleasantly surprised by two things: one, that the bread I made in less than an hour had the consistency and taste of a bread that would otherwise take hours to rise, and two, that I had some beer left over after I poured a couple glugs into the mix. This beer bread is unlike any other I’ve had before. It isn’t dry like some beer breads are, and it doesn’t have that bitter taste to it. It maintains that classic beer bread taste, with the hint of fresh yeast flavor and mild bite from the beer mixed into the batter. In other words, this recipe yields a moist, dense and flavorful bread that doesn’t scream beer, but still lets you know it’s there. The term “organic” for this bread can be interpreted loosely – though I always strive to use mostly organic products in my baking, the only organic ingredient I used to make this bread was the beer, and I’m glad I did. Though I use an organic lager, you can use whatever light beer you like. Just make sure it’s a light beer, because that’s what gives it that yeasty, beery taste. Darker beers will leave you with bitter bread, so save the Guinness for drinking. With this bread, you can have beer whenever you want – no excuses needed. Bottoms up, friends!